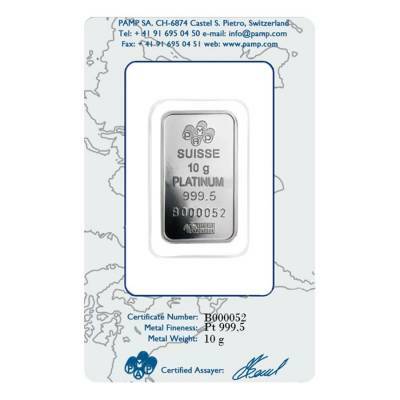 This 10 gram PAMP Suisse Lady Fortuna Platinum Bar .9995 Fine (In Assay) is an excellent combination of quality, purity, and value in the precious metals world. 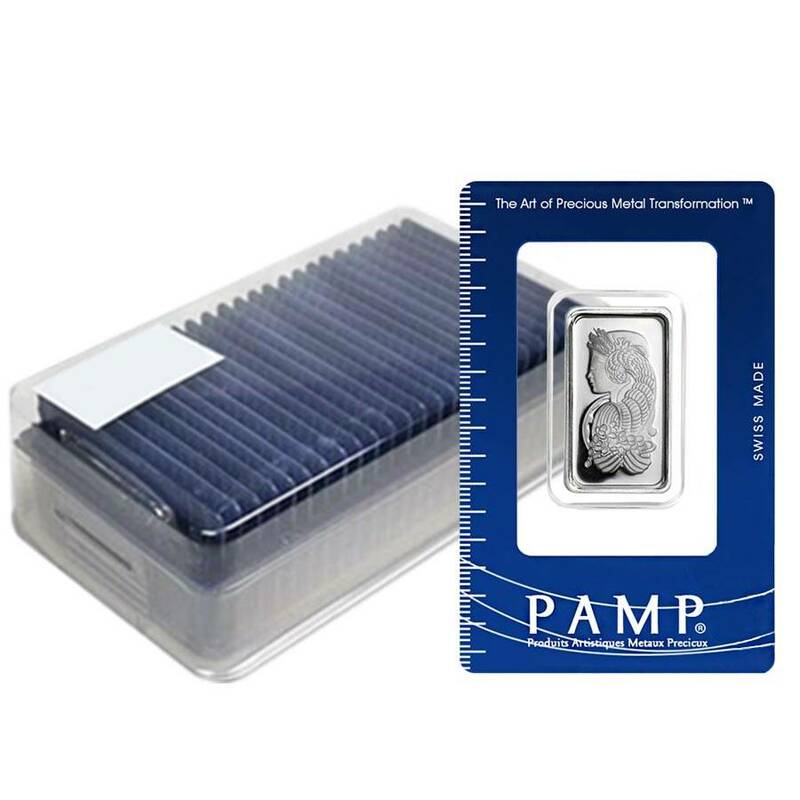 Platinum is a much rarer metal than gold and silver, making this bullion a valuable addition to any investment portfolio. 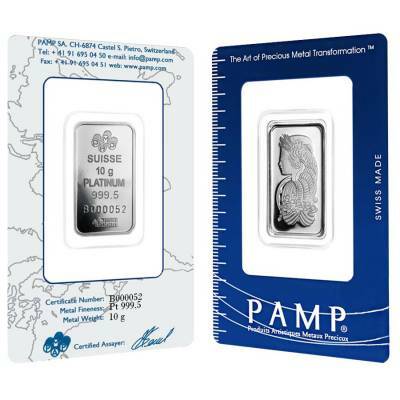 PAMP Suisse is a premier world refinery of the highest quality bars on the precious metals market. 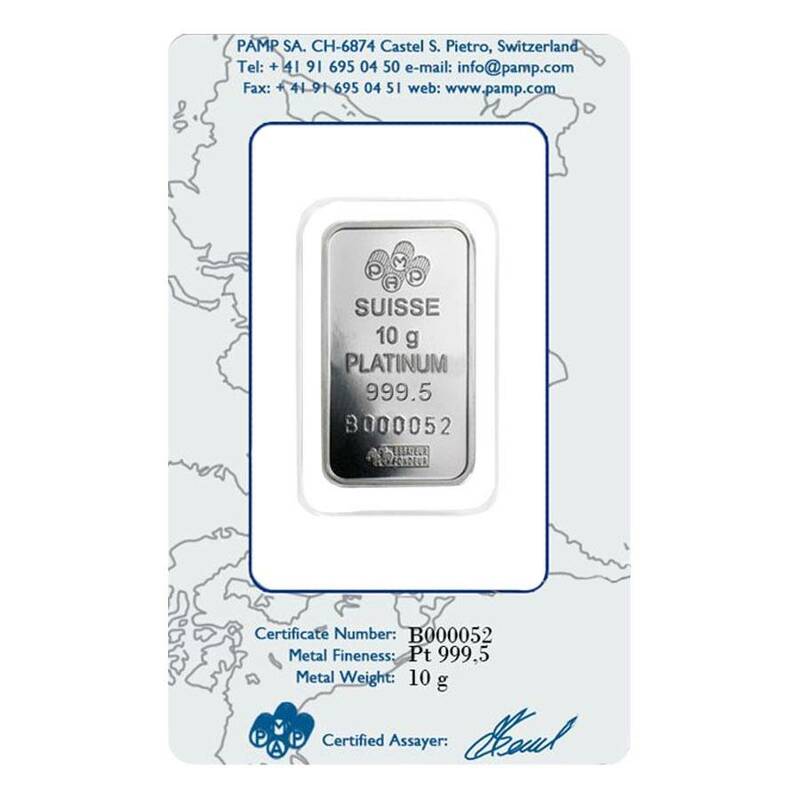 Based in Switzerland, this is a company and its products has a high global recognition through the precious metals industry. PAMP is one of the most sought-after bullion bars on the planet. On the front side of the bar, you can find the Lady Fortuna, which is very recognizable PAMP bar design. Lady Fortuna is a Roman goddess, providing luck, chance, and fate to the people. Fortuna is usually pictured as a dressed, blindfold woman, holding a cornucopia that she shares with everyone. On the back side of the bar, you can find the PAMP Suisse logo along with the weight, purity. Bullion Exchanges receive all the PAMP bars exactly from the refinery. Bar consists of .9995 fine platinum. Produced by PAMP Suisse refinery. Recognizable and classic PAMP design. Condition - New in Assay. The front of this bar depicts - Lady Fortuna. The back side showcases PAMP Suisse logo and exact weight. Bar has valuable platinum content. Made from platinum, one of the rarest metals. Individual bars are packaged in sealed assay cards. Great option for long-term investments. 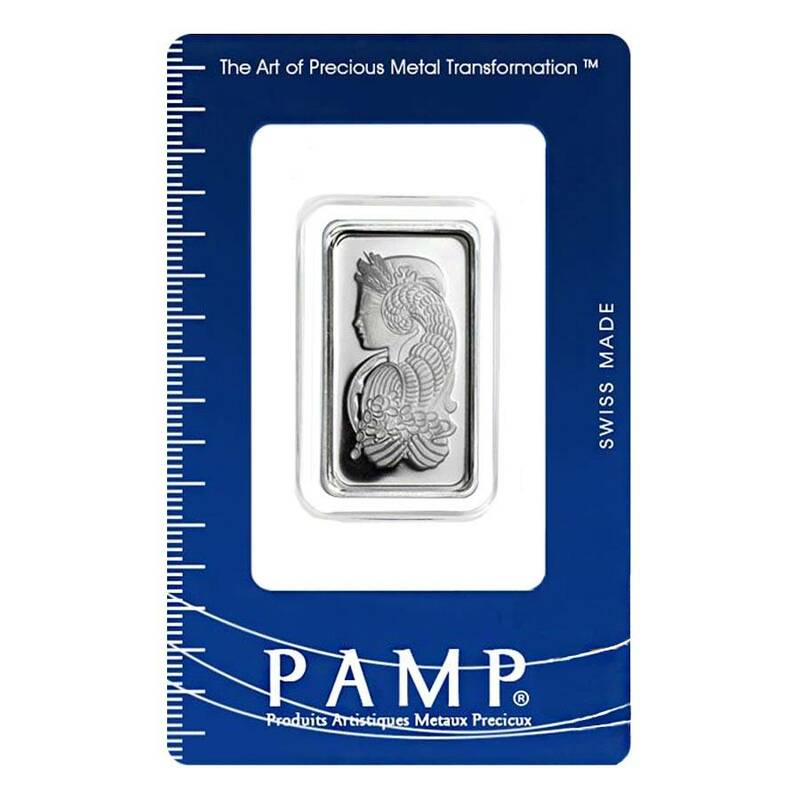 Bullion Exchanges is a reliable dealer, located in the heart of New York city - the Diamond District, where you can find bullion bars produced by the most prestigious international mints, such as the PAMP Suisse. Add this 10 gram PAMP Suisse Lady Fortuna Platinum Bar .9995 Fine (In Assay) to your portfolio by clicking on ‘Add to cart’ and your platinum bar will be safely wrapped and packaged to be shipped to you. For any questions, you can reach out our customer service at 800.852.6884 or send us a message, and we will be happy to assist you. For every $1 spend, you will earn 1 Bullionaire Buck which is equivalent to $0.001 off a future purchase. 318 BB = $0.32.